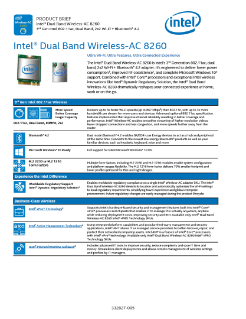 Review this product brief and discover the features and benefits of the Intel® Dual Band Wireless-AC 8260, Intel's 3rd generation 802.11ac adapter, which enables smoother streaming of higher resolution videos, fewer dropped connections, and less congestion. Intel Inside®. Faster Wi-Fi Devices Outside.